September 18, 2018, Baku – Due to the frequent incidents of unauthorized flights of unmanned aerial vehicles (UAVs) near the airports, an urgent need has arisen throughout the world to create an appropriate system for protecting these strategic facilities. 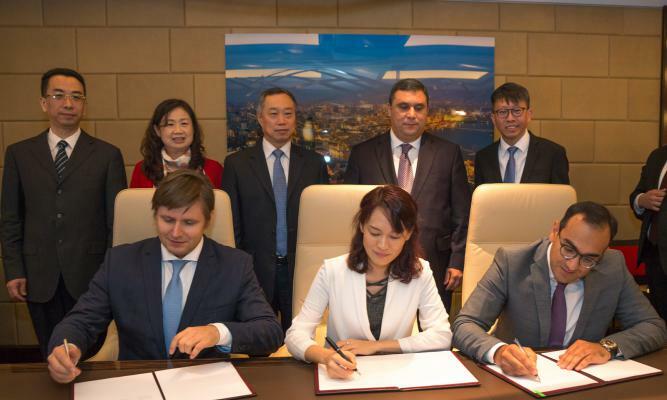 For this purpose, a delegation of representatives of high-tech companies in the sphere of innovative projects and technologies from the city of Guangzhou led by Managing Director of Abraham Technology Limited Corporation Stanislav Kochkin and Vice President of Ehang Intelligent Equipment Cora Tang, is on a working visit in Baku on September 18. Within the visit, the delegation members held meetings with representatives of the Azerbaijan Airlines, Azeraeronavigation Air Traffic Control Center (AZANS), Heydar Aliyev International Airport and the Silk Way group of companies. The guests got acquainted with Azerbaijan's civil aviation facilities, including the Azeraeronavigation Air Traffic Control Center and the new airport complex (Terminal 1) of the Heydar Aliyev International Airport, which recently awarded maximum 5 Stars rating from the Skytrax audit company. At the meeting with AZAL President Jahangir Asgarov, the parties discussed prospects for cooperation and applying Chinese specialists’ experience in civil aviation of Azerbaijan. The guests noted that the opportunities created in Azerbaijan’s civil aviation by using advanced technologies, made a great impression on them. It was noted at the meeting that Azerbaijan has a great tourism potential. It was proposed to open a new passenger flight from Baku to Guangzhou by Azerbaijan Airlines, and attracting Chinese air carriers to Azerbaijan will contribute to the even greater interest of Chinese tourists to our country and the development of business relations. The sides also expressed satisfaction with the level of cooperation between Azerbaijan and China in cargo air transportation, which has a long-standing history. The opportunities for Chinese high-tech companies’ participation in the development of services and technologies for unmanned aerial vehicles (UAVs) in civilian spheres, in particular commercial transportation, cartography, environmental assessment, civil infrastructure monitoring, etc. was discussed at the meeting. As a result of the visit, memorandums of understanding were signed between the Azeraeronavigation Air Traffic Control Center and Abraham Technology Limited and Ehang Intelligent Equipment companies. It is planned that Abraham Technology Limited Corporation, which specializes in investing and commercializing large-scale innovations, will be involved in the establishment a high-tech Free Trade Zone (FTZ) for the development of an intelligent air navigation hub and promoting Azerbaijan's position in the sphere of "intellectual air navigation". Ehang Intelligent Equipment, which began its operations in 2014, specializes in the design and manufacturing of innovative aerial equipment and the development of intelligent aerial vehicle for use in various industries. The main objective of the signed memorandum is collaboration in establishment of Command Control Centre at Heydar Aliyev International Airport to control flights of civil UAVs after their registration and certification in relevant state bodies in Azerbaijan. The establishment and the development of Free Trade Zone to be an UAV service and training center of Commonwealth of Independent States (“CIS”) region providing services including UAV operation training, maintenance services, UAV assembly, etc. at Heydar Aliyev International Airport. The parties will establish a working group to exchange information and develop joint plans for the implementation of this project.